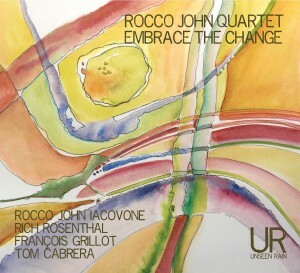 There’s an appealing looseness to this session from saxophonist Rocco John Iacovone, guitarist Rich Rosenthal, double bassist Francois Grillot and drummer Tom Cabrera. Of particular interest is the way the guitar darts between the slowly drawled saxophone lines… which becomes more compelling when bass and drums send out bursts of rhythm that frame the sense of motion within. Some tracks, like opener “Wings,” attain a head of steam and don’t relent, but then there’s tracks like “Escape,” where the quartet uses a casual tempo as the foundation on which to let loose with hyperactive solos. This isn’t pretty music. Embrace the Change is rough around the edges and everything about the delivery gives the impression that it’s not just intentional, but celebrated. And it probably should be, because that decision gives the music its character. Good stuff, and from a label (Unseen Rain) that keeps coming up with little gems. Your album personnel: Rocco John Iacovone (alto & soprano saxes), Rich Rosenthal (guitar), Francois Grillot (double bass) and Tom Cabrera (drums). Released on Unseen Rain Records. Guitarist Dom Minasi is known as an experimentalist and free player, so there is much in this set of acoustic duets with fellow guitarist Jack DeSalvo that will confound expectations. Opener “The Indelible Delible” is a free improvisation with the expected outside playing and flurries of notes—but there is also some delicate textural playing. Then Minasi’s “Angela” announces a complete change of mood. It’s a beautiful bossa, with DeSalvo taking the lead on classical guitar, followed by Minasi’s acoustic flat-top steel string. It’s simply gorgeous, and straight ahead all the way. DeSalvo’s “Aside” is a jazz tune, played on archtop guitars (credited in the album liners as “unamplified archtop guitars,” because they were recorded mostly acoustically). We’re not used to hearing unamplified archtop guitars on recordings: there’s really very little difference between this track and the previous one in terms of the guitar sound. Minasi takes the first solo, and his habit of singing his solos is especially pronounced here, but only distracting if you’re easily distracted by that kind of thing. I should note that there is sufficient stereo separation to make the two guitars easily differentiated. The next two tracks again find Minasi composing in straight ahead mode. “Julia’s Dream” is a lovely ballad, both players on archtops. “Blues for TM” is indeed a blues, this time with Minasi on flat-top and DeSalvo on archtop (he turns in an especially effective solo here). DeSalvo’s contemplative title tune again shows both players in straight ahead (but conversational) mode. The final tracks are both improvisations, but with distinct identities. “The Bee and The Fly” has the active, somewhat random movement implied by the title. “Goodbye Greensleeves” is also true to its title, beginning in a calm, folksong-like mode. As the improvisation develops unpredictability and outside playing eventually dominate, with the piece rushing to its conclusion. This was a very spontaneous collaboration. DeSalvo suggested it, and the pair got together once to try playing together. Minasi says they played mostly free, then he took out some of his straight ahead tunes “and the magic began.” So the free improvisations were recorded first, then they tried the original tunes—keeping first takes on everything. It’s the sound of two accomplished jazz guitarists immediately finding common ground, effortlessly moving from inside to outside, from composed to free. Track Listing: The Indelible Delible; Angela; Aside; Julia’s Dream; Blues for TM; Solano Dieci Anni; The Bee and The Fly; Goodbye Greensleelves.Personnel: Dom Minasi: unamplified archtop guitar, flat-top steel string guitar; Jack DeSalvo: unamplified archtop guitar, classical guitar.